On the eve of testing for Cho Dan/Black Belt, I have occasion to reflect upon what my 7+ years of practicing TSD has meant to me. I can honestly say that when I began taking classes I did not have the goal of becoming a black belt. In truth, I sought to enroll my children in karate because I felt my kids, especially my twin boys, needed a physical outlet for all their excess energy. I was hoping to find a way to encourage self-discipline, particularly in my boys, and I had the vague idea that karate would help. I really had no true grasp on Tang Soo Do or martial arts in general. Like many people, I grew up seeing commercials for Jhoon Rhee Korean Karate and an occasional Bruce Lee film. I also remember seeing a few reruns of the show, Kung Fu, starring David Carradine, but at the time, I was more interested in watching the Bionic Woman (Wonder Woman was a little too campy for me). It never crossed my mind that I could take karate myself. In my generation, it just wasn’t something girls did. When I was in college, I remember seeing a karate class practicing in the gym. I was intrigued, but there was only one girl in the group, and she was Asian, so I figured it was a cultural thing. When I sought karate lessons for my kids, I didn’t know Tang Soo Do from Ju Jitsu—where to start? Fortunately, South Hills Karate Academy was recommended to me by a friend, so I went there. I believe in God’s providence and so I see now that He I led me to the right place. Master Garbowsky was professional and friendly; he didn’t seem put off by my lack of knowledge or all my questions. When he encouraged me to try taking a class with the kids, and I saw their terrified faces cling to that possibility, I thought, ‘Why not?’ My intention was simply to accompany them through a few starter lessons until they got over their initial fear. But, from the first ‘ha dan mahk ki,’ I was hooked! I can honestly say that day opened up a whole new world of possibilities for me. Me, a middle-aged wife, minister, and homeschooling mom, a student of martial arts? Me? No way! Way. That was over 7 years ago and for me, Tang Soo Do has been way more than an avenue for physical fitness, though it has certainly helped me with my flexibility, agility, and balance; way more than a hobby or dabbling interest. For me, Tang Soo Do has been an avenue for developing and strengthening the connection between body, mind, and soul/spirit. My Christian faith (which was pulled in and applied from day one by Kwan Jang Nim Garbowsky, bless him!) was continually reinforced and supported by what I was learning and doing in the do jang. Pushing myself, setting goals, engaging my body and my mind, putting myself ‘out there,’ becoming vulnerable (and sore), being out of my comfort zone every single time I stepped on the mat, has helped me to grow physically and spiritually. Making mistakes, failing to grasp a simple concept, and looking foolish, has gone hand in hand with accomplishing a difficult move, finally learning a form, and reaching out to help a less experienced student; this has been the yin and yang of my experience with Tang Soo Do. I have been greatly challenged and humbled and yet have also found an enormous sense of accomplishment and encouragement at the same time. For me, this combination has been the soil for personal growth. The atmosphere at South Hills Karate Academy has been a significant factor in keeping me involved and committed for all these years. Seeing other students who started after me advance in rank before me has not been easy. That, and other factors having to do with the demands on me from my work and caring for a disabled child, almost made me quit a number of times. But, inevitably, when I was feeling my most discouraged, Master Garbowsky. would reach out to check on me/us, see how we were doing, and as always, encourage us to get back to the mat! You just aren’t going to get that kind of personal investment and involvement from every karate school or instructor. Aside from the outstanding instruction, the family atmosphere and the intergenerational nature at South Hills Karate Academy is probably what I value the most. Being able to practice and learn with my kids and to see them overcome fears, obstacles, and achieve goals, has been a tremendous blessing and a life-long memory for all of us. I don’t just ‘drop them off’ for their class, we take it together. As a family, all the students at SHKA not only learn from each other, we care about one another. We laugh, we practice, we groan, we practice, we test together, we talk, in and out of the locker room, and we practice some more. Although many students come for a while, but don’t stay, others do and those relationships matter. I’ve learned a great deal from fellow students; people large and small, young and old, agile and not so agile, wearing every color belt there is. For me, Tang Soo Do has reinforced the truth that being and doing are inseparably connected. Faith without work is dead. We are numinous beings who live in a physical reality. The ancient Hebrews knew nothing of the Greek idea of the separation of body and spirit—they are connected. It is the same in Tang So Do. Admittedly, I am anxious about my Cho Dan test—not because I don’t know the material, but because I do. I don’t want to ‘blank out,’ I don’t want to disappoint my instructor, I don’t want to disappoint myself. But I am reminded that the meaning of midnight blue is ‘beginner.’ We are all on a journey of learning. What matters is not just how perfectly you do the form on the day of the test, but understanding that by God’s grace, TSD becomes part of who you are and what you do. If you stick with it, it will not let you down; you’ll keep on learning and growing as a person if you love it. I do. In our martial art lives and practice, communication is a key to the success of every student. 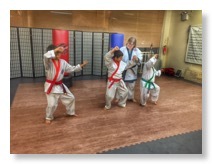 Interaction between Gup level or "beginner and intermediate" level students and Yu Dan Ja "black belts" is encouraged at each class you attend at South Hills Karate Academy. As a new student, or even students at the intermediate level, you should always seek help and guidance from seniors. Any help that you receive from a senior and even Sa Bom Nim Garbowsky or Kyo Sa Nim Jeff Weir at the Elizabeth location will help to improve your martial art experience. For newer students asking for help with you're training can be an intimidating proposition. It doesn't have to be nor should it! As a Kyo Sa or certified Tang Soo Do instructor, I see sometimes that Gup students are intimidated by the Yu Dan Ja, and often don’t approach us when they feel they need help. Sometimes this can be caused by a feeling of intimidation. If this is the case, remember that there is only one difference between being a Gup Member and being a Dan Member, and that is time. Dan members have been doing Tang Soo Do longer, and as a result are more knowledgeable because they have had more exposure to Master Garbowsky's teaching and approach to Tang Soo Do. Additionally, many seniors at South Hills Karate Academy have had more opportunities to learn from other very senior Ko Dan Ja (Master level) instructors that have visited our dojang. Don’t be intimidated, black belts were white and yellow belts once too, and they made it to their current rank through hard work and support from their seniors. All Yu Dan Ja at South Hills Karate Academy are willing to share their experiences with you. Learning to ask for help with you're training is one of the most important keys to be successful with your study of Tang Soo Do! Additionally, I see many students who come just in time for the start of class and then leave immediately after. Really, spending 10-15 minutes after class practicing or seeking some assistance on one of the many facets of Tang Soo Do training, can make a tremendous positive impact on your own training experience. With respect to approaching a senior there is what we call "Moo Do" protocol or a specific method of asking for assistance. Ultimately, you should always be respectful. Walk up to the black belt that you want help from, bow, shake hands, and then ask for assistance. This can be simply to ask for help on a specific form or hyung, practical application or free sparring. I can tell you that all of our Black Belts at South Hills Karate Academy get really excited to share our own knowledge or get in some additional practice time. When you practice with a partner or someone who has more experience than you Tang Soo Do becomes more fun and interesting! For Yu Dan Ja Dan, we are required to mentor Gup students for five to ten minutes before or after class. This means that we are to seek out Gups to help with their practice. The easiest way to pick a student to work with is to keep an eye out and see who is struggling during class, or who needs to learn a new form. Remember, it is said that you never truly know something until you teach it to someone else. In conclusion, communication and interaction between Gup students and Dan members is one of the keys to the growth and development of the individual students, the school, the Independent Tang Soo Do Association and the martial art system known as Tang Soo Do.